Kate: “…it was a nightmare every night in Liverpool where I had to read this story….and Gini and Nicky played ambient sounds in the background. We got laughed off the stage, so we gave it up in the end”. The author to which Kate referred was Jorge Luis Borges. In the 1960s he began collecting stories and legends of mythical creatures from various sources from around the world. One such story was that of the A Bao A Qu, which was originally printed in the October 4th 1969 edition of The New Yorker. 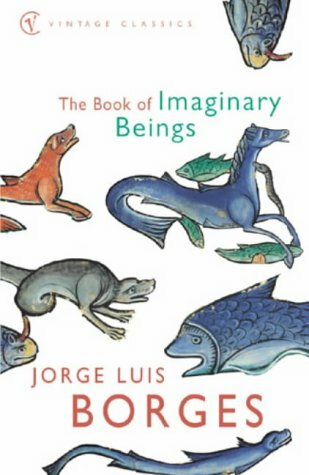 This story was to become the first entry in Jorge’s anthology, The Book Of Imaginary Beings. It was a paperback copy of the 1974 Penguin Books edition of this book that supplied Virginia with inspiration for naming her debut release. In the ancient Indian city of Chitor there stands the ancient Tower Of Victory. On the first step of the tower’s staircase lies the dormant, invisible creature the A Bao A Qu. It is only when visitors enter the tower and begin to ascend the stairs that the A Bao A Qu stirs from its slumber and begins to follow the visitor. As it does so “at each level the creature’s colour becomes more intense, its shape approaches perfection and the bluish form it gives off is more brilliant”. Eventually…”it achieves its ultimate form only at the topmost step, when the climber is a person who has attained Nirvana and whose acts cast no shadows”. As with all legends handed down by word of mouth through the years, this story – and its true origins – have become muddled over time from telling and retelling. The legend as it presently stands was first recorded by C. C. Iturvuru in an appendix to his now classic treatise, On Malay Witchcraft (1937), the title of which rather betrays the geographical origin of this legend. It has only been in the last ten years that it was discovered that in fact the legend was based on a story told to writer C.C Iturvuru by a member of Orang Asli, one of the tribes native to Malaysia. Unfamiliar with their speech pattern and the way they slur their vowels, it is now accepted that Iturvuru misheard/misunderstood various words and simply wrote down phonetic spellings. Accordingly, when the tribesman mentioned in his story, the Abang Aku (My Elder Brother), Iturvuru wrote it down as being A Bao A Qu. Similarly,the word Cherita (or Cerita….meaning Story) was written down as being the place name of Chitor. The legend as passed down by the Malaysian tribes through the centuries tells of a “Spiral stairway connecting one dimension to another… a stairway once used by visiting and incarnating Stargods”. The reference to Abang Aku (my elder brother) is thought to be a reference to the Orang Asli people themselves. As a Orang Asli shaman once noted “Our spirit will not be free until the younger races achieve nobility of purpose and purity of heart”. To conclude this article, it’s worth returning to the Borges version and highlighting a couple of aspects of his story to that of Virginia’s recordings. Firstly, it can be assumed that the striking blue cover artwork of the A Bao A Qu EP is directly influenced by the reference to “its shape approaching perfection, and the bluish form it gives off is more brilliant”. Secondly, could the reference to “where acts cast no shadows” have been the inspiration behind the title of ‘Shadows Will Fall Behind’? Finally, although Virginia would have had no idea that she was calling her first ever release ‘My Elder Brother’, in a way it was quite apt considering that Virginia’s eldest brother Jon Astley was very much involved in the recording of the EP!